Never miss a billable second of productive time, or lose track of an expense again. 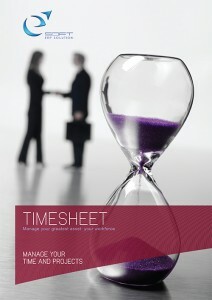 Our Timesheet helps you to increase your billable hours by better managing all your projects, clients and work hours. With just one system you can manage your project, expenses and employees. It literally takes seconds for your employees to record their time spent on each project each day / week. Finally, approve your employee’s time sheets (if required), print your reports, and export the data to your project management / payroll / financial systems. Everything is so simple! Track time and expenses towards projects, clients or any entity your business requires. Flexible Reporting Options. Generate the reports you need within seconds. Design your own reports using our Report Designer. Integrates with Accounting, Project management and Payroll system. Set default rates at the client, project, activity and employee. Automatic Invoice feature. Generate Invoices from Time entered based on employee cost rate. Content management capabilities. Unlimited attachments. Spend less time reviewing/approving Time Sheets. Supports an unlimited number of employees, works and projects.